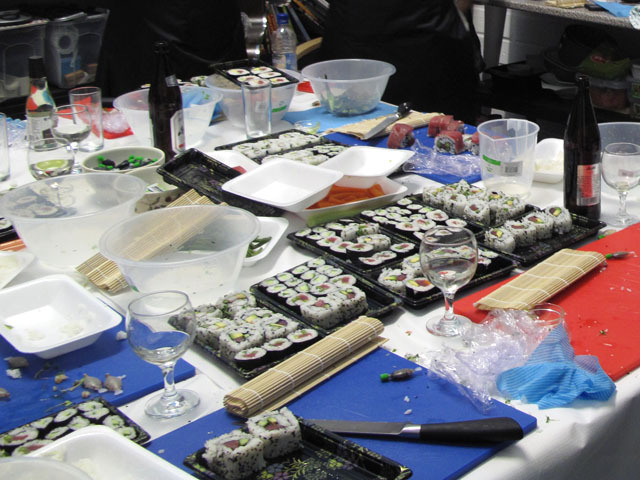 A MASTERCLASS IN SUSHI MAKING WITH CORNISH SUSHI. Who could resist a description like this? 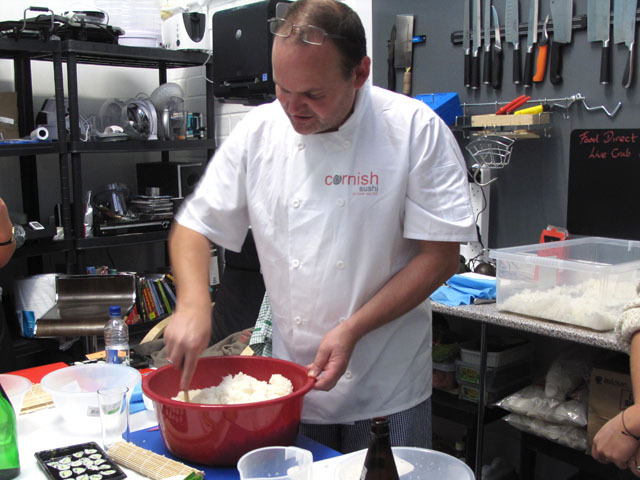 With aspirations of learning a thing or two about sushi-making, seven of us ventured up to Cornish Sushi’s teaching kitchen in Wadebridge. Phil Mitchell, owner of Cornish Sushi, is extremely likeable. His warm-hearted nature makes him a good teacher – patient, chatty, generous and good-humoured. We gathered in his newly refurbished teaching kitchen on the Trenant Industrial Estate in Wadebridge. 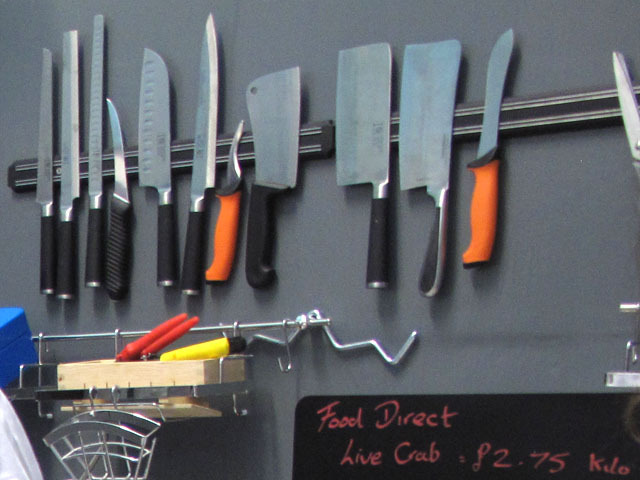 The table was laden with ingredients and implements, the walls lined with shelves, knives and blackboards listing the current prices of local crab and game, as supplied by Phil’s other company, Food Direct. Louise was busily preparing asparagus and green beans while we listened to Phil, who attempted to teach us what it takes ten years for a Japanese sushi chef to learn. Wash off the starch in 9 or 10 changes of water until the water runs clear. Stand in water for 10 minutes to open the grains so that they will absorb the vinegar better. Put one cup of water to each cup of rice in a pan, add a stamp sized piece of wakame (seaweed) for flavour. Cook on a rolling boil for 3 minutes, simmer for 10 minutes and leave off the heat with a lid on for a further 10 minutes. 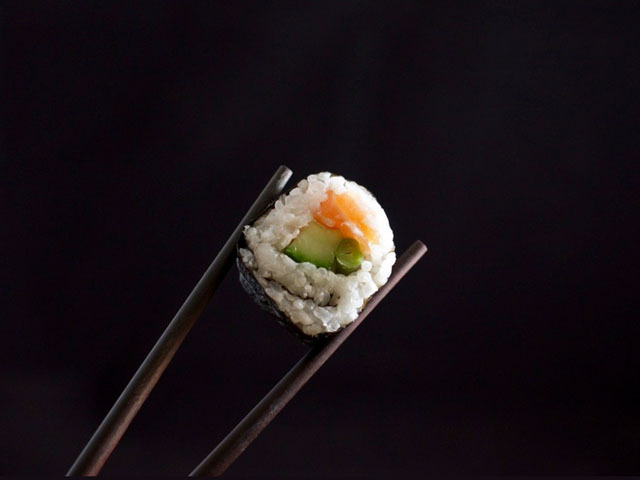 First up, we practiced with a couple of little cucumber rolls, made with half a sheet of nori (seaweed), rice and (precisely) one twelfth of a cucumber, seeds removed. 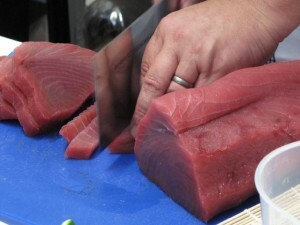 We used beautiful sashimi grade tuna which isn’t easy to get hold of in Cornwall. I would like to try using beef fillet or mackerel but it does need to be of top quality. Next on the production line, some bigger rolls made with whole sheets of nori and a strip of tuna through the middle, plus a dab of wasabi, asparagus and green beans. The “inside out” rolls were gorgeous. We had to spread the rice on the nori, sprinkle with sesame seeds and cress, and then flip the whole thing upside down without it breaking. 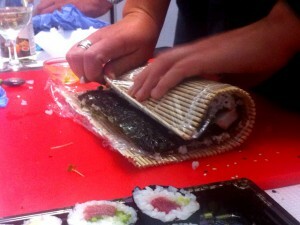 Once the filling was positioned, they were rolled up as before. We made lots of these containing various combinations of crabsticks, tuna, avocado, asparagus, carrots and green beans. 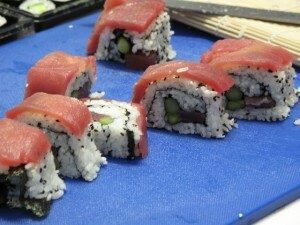 Phil added a thin slice of tuna to the top of his inside out rolls. 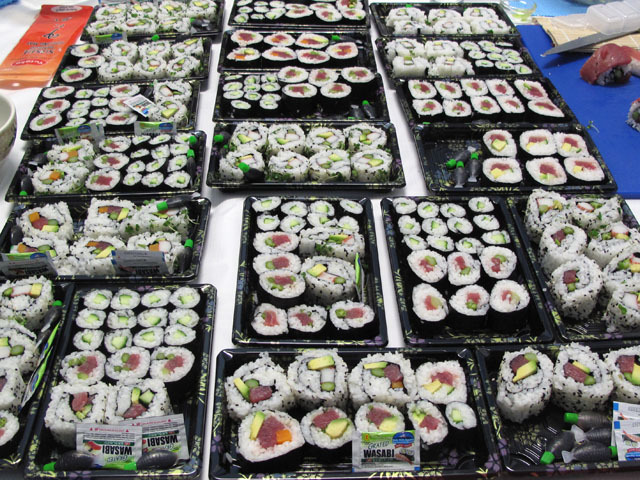 Cornish Sushi provided us with everything that we could need, and more. 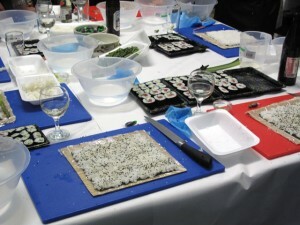 Tea, beer and sake throughout the lesson, sushi mats, sharp knifes, clean aprons and heaps of ingredients. We were given proper lidded boxes to take our sushi home in, with little sachets of wasabi and tiny fish-shaped bottles of soy sauce. I’d urge anyone to sign up for a sushi lesson. It’s much easier than you think and the class was so enjoyable – the perfect way to spend a cold evening. 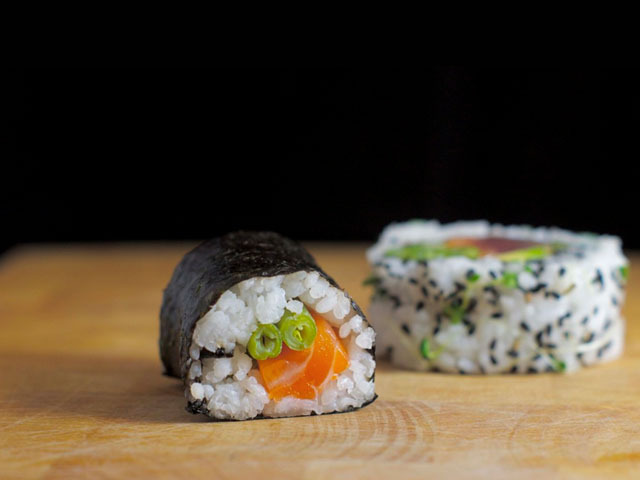 Plus you get to take away everything you make and show off your new found sushi making skills when you get home. 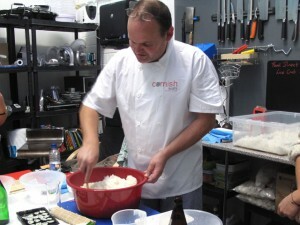 Cornish Sushi run regular sushi lessons at their kitchen in Wadebridge. 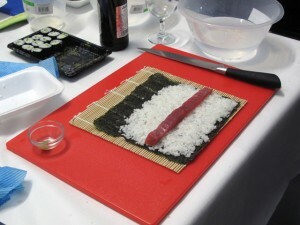 For further details of sushi parties and pre-prepared sushi please visit Cornish Sushi’s website. Images by LammaJamma and Ellie Michell. Hi Richard, you need to contact Phil direct on 07594 176198 – I will pass your message on to him too. Just wondering if you do take out sushi?